Simply Charming Boutique, the wonderful store downtown where most of my jewelry is for sale, is moving from the Loudon Street Mall around the corner to Picadilly Street. The owner, Brenda, is expanding her artisan jewelry collection and encouraged me to “have more of a theme” with my collection. I am well aware that my style is all over the board, and until now I have kind of just made whatever I feel like. Over the past six years (has it already been that long?!) I have heard many people suggest having one cohesive “line” each season. I’ve put it off because I’m into lots of different techniques and styles, so it’s hard for me to pick one or two. What if I my line doesn’t sell because I chose a style that doesn’t interest people? I guess I’ll have to risk it. And for the pieces that don’t fit the look of the current line, I can list them on Etsy for people outside of my little town. In September when the shop moves I’ll probably have a larger space at the new location, but I don’t want it to be crammed with stuff. I keep telling myself I can always add to it if pieces sell. Right now it’s the middle of summer and I took the end of July to brainstorm. 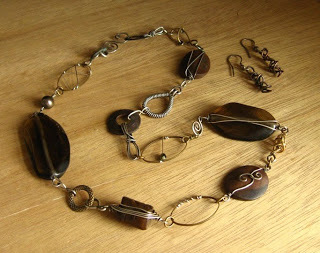 For the first line (“Elements”) I’m going to use mostly metal (instead of stones, pearls, lampwork, etc.) to give me a chance to do some metalwork. I want it to have a rustic feel: oxidized metalwork, handmade components, a mix of metals, brushed finishes. Since becoming a mom my daytime priority has shifted from jewelry to my daughter. I make jewelry when I have time; usually it’s during her afternoon nap. (I purposefully keep the lighting in my studio “bad” in order to make myself leave work and have a break when it’s dark outside.) This week I’m having babysitters come over to play with Olivia in the mornings, which gives me another chunk of time each day and lets me stay focused. My fingers are constantly black from oxidizing and polishing, but it feels good to have a goal. I’ll work on the Elements line until it feels like I have enough for a grouping, and hopefully after that I’ll start on a second line: rich, deep colors, faceted stones, chain… Will keep you posted!